Your Event Photo Booth Hire Adelaide has provided photo booth hire throughout Adelaide from its Happy Valley base since 2012. As well as servicing Happy Valley and local suburbs such as Sheidow Park, Aberfoyle Park and Woodcroft we have also provided photo booth hire all the way from Victor Harbour to Tanunda in the Barossa Valley plus of course the city of Adelaide itself. Happy Valley is around 20km south of Adelaide in the City of Onkaparinga with a major feature being the Happy Valley Reservoir. It’s South Australia’s largest water treatment plant and supplies a lot of the metro area. It was built between 1892 and 1896 and covered the original township, school and cemetery. It all had to be relocated with the buildings demolished and any fruit trees and vines salvaged. Therefore, the myth that the old church steeple can be seen above protruding from the water when the reservoir is low is just that, an urban legend. There are many great venues near Happy Valley besides hosting a house party. The Reynella Football Club, Flagstaff Hill Golf Club and Hardy’s Winery to name just a few. 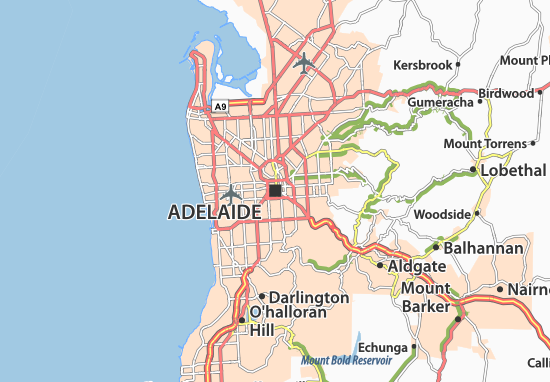 Plus of course the city of Adelaide is just up South Road and along ANZAC Highway. The most recent photo booth hire we provided was just around the corner for a 50th birthday party that Peter arranged for his wife. They chose the classic enclosed photo booth which fits two to three people comfortably however after a few drinks people can get quite creative and find ways to fit more faces into the photos. So where ever you are in Adelaide consider getting in touch with Your Event Photo Booth Hire Adelaide to bring out the smiles at your next event. The photo booths are always a big hit.